Share pictures to any device on the local Wi-Fi network! Instead of the tiny screen of your phone, view your photos on a tablet, a desktop with a 23" screen or a wall-sized Internet-enabled TV. If it has a web browser and Wi-Fi, you can share to it! Multiple friends can view your shared album, each at his/her own pace, while you use your device normally. Uses the photo albums you already have set up on your device - create more at any time. Keep a slide show - or several - in your pocket. No accounts to set up, no passwords to manage! If you have a Pre3 or TouchPad, and a friend with a Pre3 or TouchPad, use Touch-to-Share for instant magic! Apple Macintosh computers are also a snap, thanks to Bonjour. You can also take advantage of e-mail, instant messaging, SMS, Neato!, Twitter or DropBox to connect. 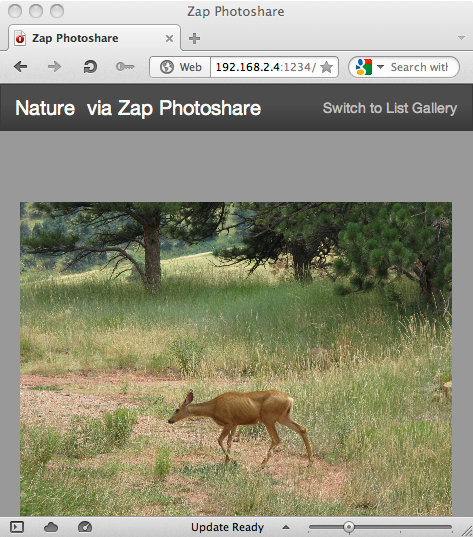 Zap Photoshare requires webOS 2.2 or higher. The Pre3 and TouchPad come with this, and the Pre 2 can be upgraded.